Be positive with your son; let him know he is accomplishing something special by being part of the team. Don’t put him down. Don’t offer excuses for him if he is not playing. There is usually a reason for it. Encourage him to work hard and do his best. Don’t put down his coaches. Remember the coach represents the “boss”, the “authority”, the “parent”, the “teacher”, the “law”, etc. If there is a concern about a certain situation or coach, contact the head coach and schedule a meeting. If you constantly bad-mouth your son’s coaches, how can you expect the youngster to respect and play for them? Whether he is a first-stringer or a seventh-stringer, players must follow rules pertaining to curfew, drugs/alcohol, girlfriends, promptness, and school. 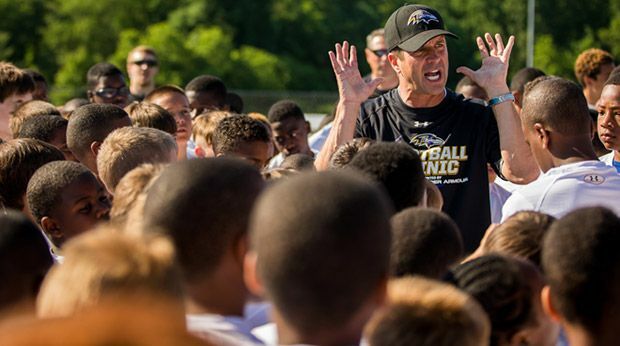 Football is a very demanding sport and coaches must concern themselves with a player’s off-the-field activities in order to get the maximum physical and mental performance out of their players. Insist on good grades, good attendance, and promptness at school. Check the number of hours your son spends on homework. It is the duty of the parents to see that their son is working in the classroom. No matter how good a player is, if he doesn’t have good grades, he doesn’t get into. Eliminate the use of the car, video games, cell phone, computer, television, etc. that cut into study time. Don’t criticize other players because you dislike their parents. Don’t try to live your life vicariously through your son. Football is a youngsters’ game; let them play it. Don’t show animosity or jealousy to any of your son’s teammates because they carry the ball more, score more touchdowns, or even get good press. This type of envy rubs off on your son and it can devastate a team. Who cares who scores or makes the big play as long as everyone does their job to the fullest? Don’t be a know-it-all. The coaches work with the players nearly year-round and they know what each player can and cannot do. As a fan, you are entitled to scream your head off, but please don’t become belligerent and arrogant toward players. They are amateurs, as are the coaches. Coaches know their talent. Respect that. Insist on your son’s respect for team rules, school rules, game officials, and sportsmanship. There are valid reasons for rules in any society. Don’t let him make fools out of his family, school, and team for some uncalled-for gesture or incident that brings him shame. Self-respect begins with self-control. Encourage your son to improve his self-image by believing in himself. Don’t compare and contrast your son with family members who played previously. Every youngster is different. Don’t add pressure by expecting him to live up to an older brother’s individual accomplishments. 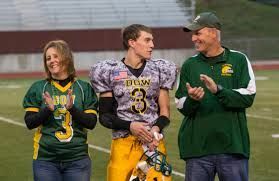 Encourage your son to play for the love of the game, not for a scholarship. This alleviates a lot of pressure on the youngster. Scholarships are in the hands of college recruiters. Many talented players fizzle because the pressure on them to get a scholarship causes them to become selfish. Insist on unselfishness; football is the ultimate team sport. Good things usually happen to the unselfish, hardworking athlete. 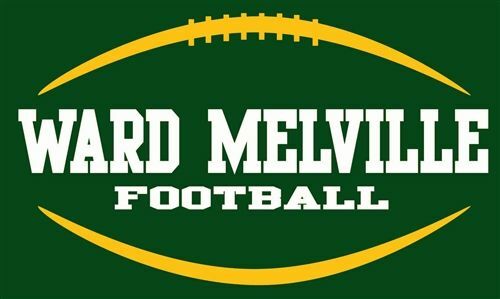 Check out the Stack Varsity Ward Melville Football home page and support the Patriots! Keep up with the burgeoning Stony Brook Seawolves Football program.